What is an Amulet Bag? My latest trick is to take hand dyed, variegated thread which I buy from Rainbow Threads and crochet green beads into the green sections of the thread. You could pick any one of the colors in the thread to focus on. What happens is this lovely random clumping of beads throughout the pattern. You could easily make a lovely small or large draw string bag with this technique using single or double crochets. Below is a picture of what I am currently working on using this technique. My scan didn't show off the colors very well, at least on my computer. It seems to show up a bit brighter than it really is. There is also a picture below of the thread before I wound it on to a spool to crochet with it. That picture seems to show it off better. I was trying to emulate a fall leaf. See what you think. If you want to use your Bead Spinner with Charlottes or size 15 seed beads your needle-hook might be too large for the inside diameter of the bead, if so, you can use any size straight beading needle. The process will be a little slower and you will need to make sure your needle stays as close to the top of the beads as possible so that it does not catch on the bottom of the Bead Spinner. To block your work, wet your crocheted piece or dampen with a wet cloth, stretch, reshape, and pin to an ironing board or some such surface and allow it to thoroughly dry. I like to use a product called "Quilter's Cut'n Press." Crochet stitches should be the same size as the shank of your crochet hook. If your stitches are larger than the shank of your hook, you are crocheting too loosely. I have found that people who crochet a lot with yarn sometimes have trouble making the transition from yarn to thread and end up with very loose stitches. Thread crochet tends to look better if your stitches are compact but not tight. If you find you are having trouble keeping your stitches from being too loose, I suggest you try using a crochet hook a size or two smaller or practice using a tighter tension. If you have never crocheted with thread before, it can be a little discouraging when you pick up one of those tiny needles and that thin thread. But there is hope, let me tell you how I got started. I went down to my local craft store and bought some thread and a lovely pattern I thought would be fun to try, then I went over to look at the hooks. AHHHHHH, but after I calmed down, I found one that I thought looked like the right size for the thread I was going to be using. It was a size 3 Susan Bates. I didn't know, at the time, that it was not the correct hook to use for size 10 crochet thread but you know, it worked and I made tons of lovely things so who cares. After I had been crocheting with it for awhile I became very confident and decided to try the hook that was suggested in the patterns for size 10 thread. I was surprised at the difference in size but it didn't matter. I was used to working with the smaller hook and thread. I strongly recommend this method. It really helps take the fear out of thread crochet especially if you learned to crochet using yarn and are now trying to make the transition. I suggest you buy a Susan Bates size 1, 2, or 3 hook and either size 5 or size 10 DMC Cebilia, or Coats & Clark Opera crochet thread also in the size 5 or 10. The size 5 is a larger thread and would be easiest to work with. You can find it at your local yarn store or have them order some in for you. I highly recommend these nicer threads. As a lot of crocheters do I used to buy the less expensive threads when I started out because that's what I felt I could afford but after I had been crocheting for several years I decided to try some of the DMC threads and I was hooked. I couldn't believe how much easier crocheting became for me. The nicer threads have a soft sheen and a tighter twist to them which allows the thread to glide more smoothly off your hook, in and out of your stitches more easily, and it doesn't split as easily when crocheting. Here's is a test I do for all my students. Take one end of the cheaper thread in each hand and pull it apart. Now take one end of the nicer thread in each hand and pull it apart. The difference is obvious. About 12 years ago I crocheted some BEAUTIFUL table cloths out of the cheaper threads. Over time the threads began to deteriorate and are now breaking in places. That doesn't happen with the nicer threads. If you are making more craft type items for decoration only, it won't make as much difference but if you are putting many hours of your time into a beautiful table cloth, bedspread, or even a doilie, and want this treasure to last, use the nicer threads. You will appreciate their staying power and look after many years of washing and use. 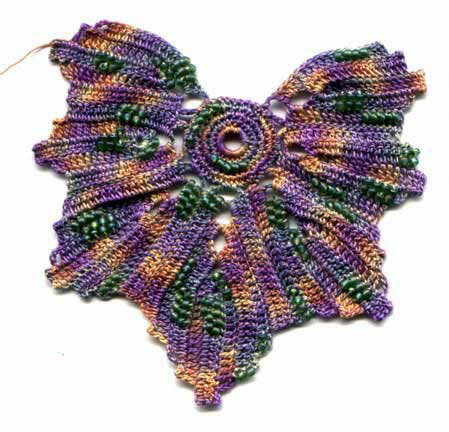 Leisure Arts doilie crochet pattern. Pick a book with designs that do not look very fancy. The plain patterns are easier to learn. I always recommend that people start with a Leisure Arts doilie pattern. They are my favorite. Their directions are clearly written and user friendly. I also recommend you start with a round doilie pattern. When you are just getting started I have found it easier to crochet in the Round (Rnd) than to crochet in Rows. If you need one on one instruction, but don't have anyone in your area you can ask for help, I suggest you buy a crochet video tape. There are a few out there on the market that are quite helpful. Here is a link: http://www.victorianvid.com/ Good Luck! Research on the internet can be fun and easy. Start with the obvious. Type in exactly what you are looking for. If that doesn't bring up what you want, try one or two key words. Then try different words that mean the same thing (synonyms) and see what that does for you. Each set of key words, even if they are slightly different will bring up many new and different sites. As you continue on with your research you will begin to learn more about your subject, use that information to refine your search. You will then be able to continue on with new key words that bring you closer and closer to the end of your quest. I usually use Google.com or Yahoo.com but there are several good ones out there from which to choose. If you are a beginning left handed crocheter and can't find any diagrams for left handed crocheters, I suggest that you find a book that shows you how to performing the stitches with diagrams, then scan the pictures into your computer and by using a program called "Adobe Photoshop" you can flip the pictures. You can also have the image flipped if you take it to a copy store. When you begin and end any project, always leave an 8-12 inch tail. You will then be able to easily weave in all your ends when you are finished. First find a nice cluster of stitches and do what I call a three weave stitch. To make a 3 weave stitch weave your thread under a cluster of stitches, catch a thread on the other end and weave the thread back under the same cluster of stitches, again catch a thread on the end, and weave the thread back over the same cluster of stitches then finish off. You need to catch a thread on each end so when you pull the thread back through again you are not undoing what you just did. When doing a 3 weave stitch you are creating a locked stitch which will not allow your project to unravel at a later time. Sometimes you can get away with a 1 weave stitch, or a 2 weave stitch but most of the time I like to do a 3 weave. I like to use a Tapestry Needle when doing the 3 weave stitch. Never finish your projects by cutting the thread too close to your beginning or ending slip stitch. if you do, your project will most likely come apart over time with cleaning and use and could be very difficult or impossible to repair. Amulet bags are generally worn at HEART LEVEL. In ancient times they were used by Native tribes to carry herbs or things to ward off evil spirits. In other words, they were sometimes worn for protection. They were also used to carry precious mementos of loved ones, or prayers. If you have a family member or friend who is going through a tough time you can put prayers in it for them. Every time you look at or touch the bag you will be reminded to send them love and prayers. Love is very powerful for healing the mind, body, or spirit. Also, if you have small gifts that others have given you, you can put those in the bag. Gifts from family and friends are generally gifts of love, even if it's just a card or a tiny piece of the card. Gifts of love are thought to hold the energy of love for the recipient of the gift. So if you are feeling down or in need of love or just want to be reminded of the fullness of the love that already exists in your life put those special gifts from loved ones in your bag. Today most people just wear them as jewelry, others sometimes put crystals in them. Personally I like to fill mine with prayers of love, and peace.